We have analyzed Hadoop workloads from three different research clusters from a user-centric perspective. The goal is to better understand data scientists' use of the system and how well the use of the system matches its design. 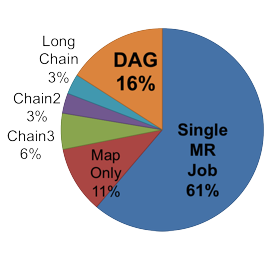 There are a significant number of independent, small-scale jobs that may be amenable to simpler, non-Hadoop solutions. 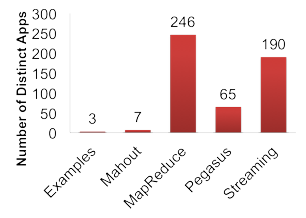 Surprisingly few users are using higher-level declarative frameworks, though some are constructing "manual" workflows. Workloads are highly diverse, suggesting the need to effectively author and efficiently execute a large variety of applications. Significant performance penalties are arising from over-reliance on default configuration parameters. automatic optimization and tuning of complex applications. Hadoop's Adolescence: An Analysis of Hadoop Usage in Scientific Workloads. Kai Ren, YongChul Kwon, Magdalena Balazinska, Bill Howe. Very Large Data Bases (VLDB), 2013. We thank N. Balasubramanian and M. Schmitz for helpful comments and discussions. We also thank the owners of the logs from the three Hadoop clusters for graciously sharing these logs with us. This research is supported in part by The Gordon and Betty Moore Foundation, National Science Foundation under awards, SCI-0430781, CCF-1019104. Qatar National Research Foundation 09-1116-1-172, DOE/Los Alamos National Laboratory, under contract number DE-AC52- 06NA25396/161465-1, by Intel as part of ISTC-CC.